With the Apple Watch Series 4, it’s a little like Apple took a sizable slice of OLED screen and then allowed it to melt, gently slumping, across the curved coverglass of its fourth-generation wearable. Little prepares you for just how beautifully integrated the new, 30-percent larger screen of the updated smartwatch is. Ostensibly the same size, physically, at first glance, there’s no escaping the feeling that Apple is maximizing what space it has to play with now. The Series 3 and prior watches suddenly seem faintly cramped. The obvious use for all that extra screen real-estate is more data shown at once. Indeed, some of Apple’s headline watch faces for this 2018 model are densely packed with information. Lots of complications, lots of little bars and sigils that show extra data. If you’ve always wanted to know, not only the current temperature, but the forecast highs and lows for the day, the Series 4 will satisfy you. Honestly, though, I much preferred the faces at the opposite extreme. Options like the water face, which flood what almost feels like the whole front of the Apple Watch with rhythmically undulating waves. They’re simple but mesmerizing. What I’d wanted to try, of course, was the new health features. 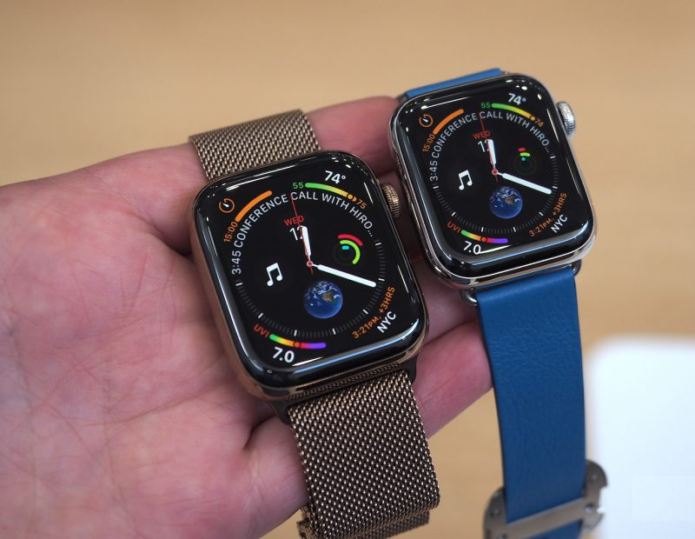 Apple has two flagship additions with the Series 4, the watch’s ability to spot if you’ve fallen over, and to take an ECG – or echocardiogram – of the wearer. Sadly the software for that isn’t available yet, so Apple wasn’t demonstrating it. All the same, the potential isn’t hard to see. Slips and falls are big problems, not just for the elderly, though I suspect that’s likely to end up a key market for the Cupertino firm and its new wearable. The ability for the Apple Watch Series 4 to track if you’ve taken a tumble and then automatically call for help could make this the must-have gift for aging parents and grandparents this holiday season. ECG measurement, too, could be a game-changer. Apple isn’t actually the first company to deliver it in a consumer product, but it’ll probably be responsible for popularizing the technology among everyday users. The number of actual health problems it spots is likely to be significantly overshadowed by the number of hypochondriacs it reassures on a daily (or maybe hourly) basis. Otherwise, this remains a sleek and use-friendly smartwatch. Apple’s upcoming watchOS software update will make it even more usable standalone – particularly if you have the cellular model, which adds a $100 premium to the $399 starting price of the WiFi + GPS version. Either way, you get the new Digital Crown with its haptic feedback. It’s subtle, like you’re nudging it past a tiny detent each time, but I suspect it’ll make navigating longer lists feel far more precise. Considering Apple’s goal has always been maximizing how much you get out of the shortest interactions with the Apple Watch, that has to be a good thing.